A 125-year-old Portland warehouse is now home to transportation startup, moovel, designed with alternate venues for productivity, salvaged materials from the existing space, and access to broad daylight for every employee. Hacker was engaged by moovel, a transportation technology company, to design their offices located in Portland, Oregon. Designed to reflect their unique start-up spirit, moovel’s new headquarters in Portland’s Old Town Chinatown district is less corporate office and more “laboratory-workshop-studio garage.” Skylights and windows bring broad daylight access to cozy desk pods; living room-like nooks and conference rooms offer alternate venues for team-based and individual work; and spacious communal areas can accommodate larger collaborations and community meetings. Curving, hearth-like walls and a gas fireplace in the central hub welcome visitors and employees to an office designed for the community-building, future flexibility, and friendliness essential to moovel’s culture of invention. 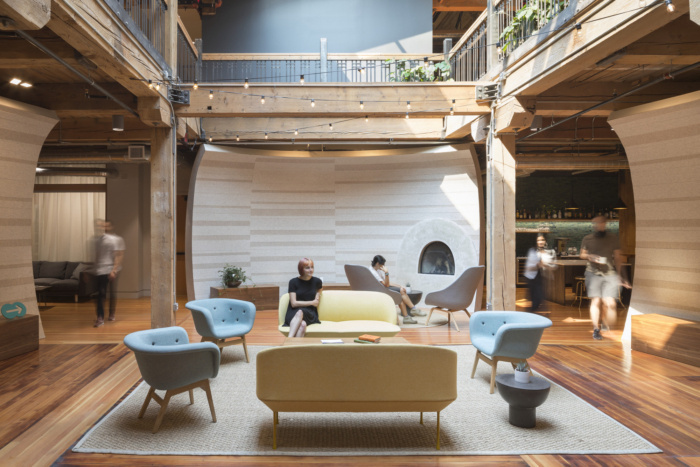 As part of the renovations to a vacant 125-year-old warehouse, the design for moovel’s headquarters incorporates many materials salvaged from and inspired by the original warehouse: wood floors are crafted from timber found in the original structure, and exposed brick wall interiors and masonry stay true to a classic Old Town Portland look.